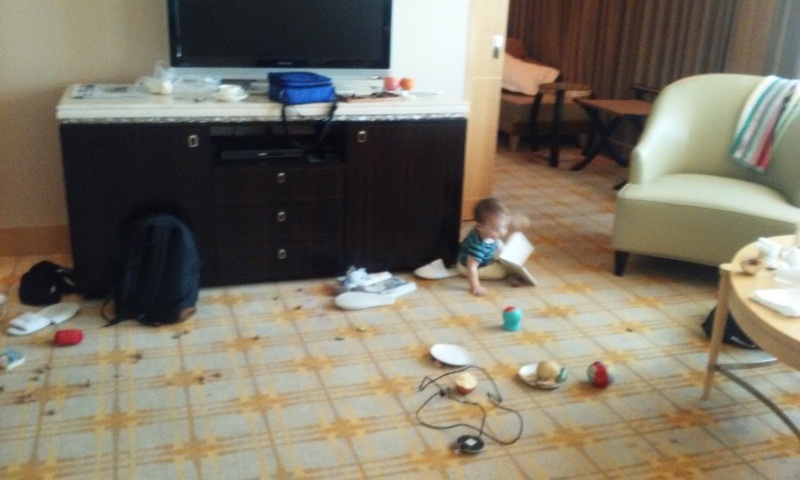 Dave's conference is over. It was a success by all accounts, and the ending is bitter sweet; he's already missing the camaraderie and the rush of excitement that went into organizing and running the show. For the next week he is, disconcertingly enough, on vacation. We're flying to Tokyo this afternoon. After the end of the conference, he and his teammates went through the exercise of naming their favorite parts of the event--no duplicate responses allowed. For me, the highlight of this week was seeing Bowie's reaction to a masked dance, a traditional Chinese performance we watched at a local restaurant. The outing was a part of Dave's conference--an event for all of the employees of his company, to which Bowie and I tagged along. To make it to the show, I had to wake Bowie from his nap, and in his drowsy, jet-lagged state, he was cranky with me. His mood started to change as we entered the restaurant, in response to all the people who were smiling and cooing at him. And then he saw a performer walk by, and in front of his eyes, the performer's masked face changed colors! Bowie's jaw literally dropped. 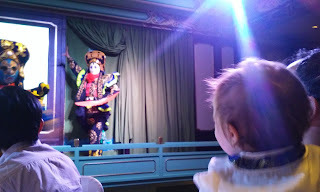 He laughed of joy for the next twenty minutes as the masks danced and played with fans, and then transformed into acrobats and performed feats of strength and balance. Taking Bowie to this show, we had no idea that he'd be able to appreciate it--if anything, we expected him to get cranky and to nurse through another boring dinner. But now that I think about it, the bright lights, the music, the people, the funny walks are all his favorite things. How could he not love the show? 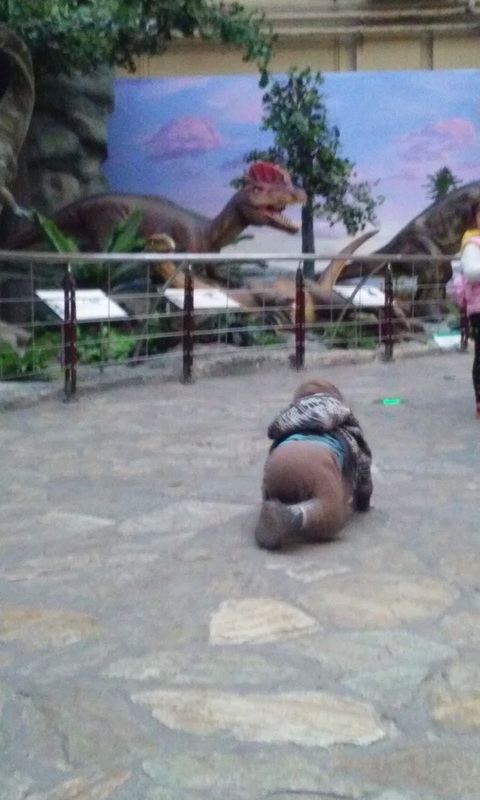 And if I were to speak for Bowie and name another highlight of this week in Beijing, it would be yesterday's excursion to the Museum of Natural History, aka animatronic dinosaur heaven. Thank you, travel blog: I don't think I would've dared to take Bowie across the city for it, if not for the way blogging creates pressure to get out of my comfort zone, to have something new to write about. This museum was recommended by Laura, the interpreter at Dave's conference, who advised this instead of going to the zoo (the animal there are kept in sad conditions). 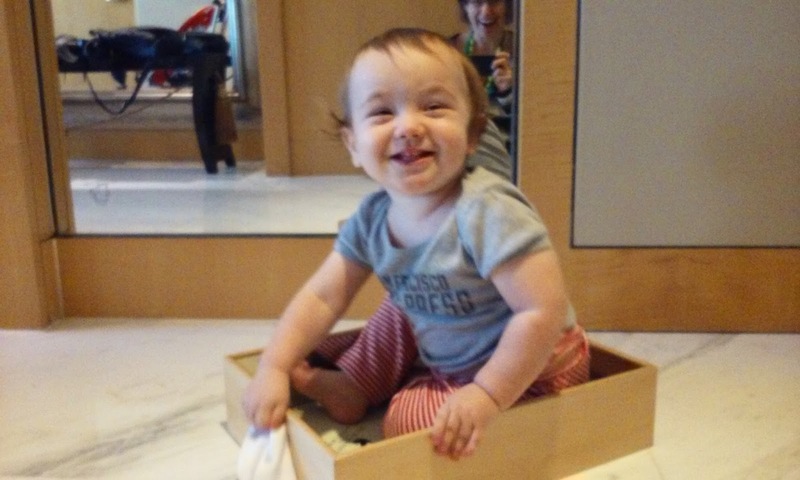 As soon as we arrived, we knew we came to the right place because of how many babies of Bowie's age we encountered. For the price of $1 per adult (might be cheaper for locals), many new moms seem to bring their crawlers and early walkers here. What's not to love, especially if allowed onto hands and knees? Broad granite hallways occasionally give way to rock and glass and linoleum flooring. 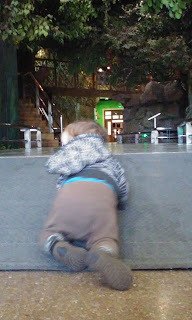 Ramps and staircases lead to different habitats, from the cave-like dinosaur room to a bamboo forest made of real bamboo with bamboo sticks strewn around the floor for the taking. Bowie wants to touch it all and feel it all, and most of the time he can. A roar comes from above--as animatronic dinosaur lifts his head. So what? Here comes the next staircase, and the next one after that. What's this? A rose garden under glass? Thank you, museum designers, for taking such thoughtful care of your roses. Bowie gets it: look, but don't touch. He looks and then moves on to the next staircase. Oh, wait, a new friendly baby. Let's say hi and pose for another set of photos. FYI, nursing nursing in public seems totally fine in China. I've nursed Bowie in a park and at a bus stop, in a yard of a residential building and at this museum. 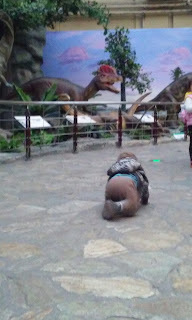 At the museum, around closing time, there were several of us parked on the benches at the exit with the nursing babies. Most of the time people didn't pay us any attention, and when they did, they smiled and walked on--unless accompanied by toddlers, who wanted to know what we were doing and came over to say hi to the baby. -- Telephones have chords! Doorbells ring like bells! Elevators have buttons! It's Bowie in a box! Bowie in a box is the best portrait ever! I think he looks a bit like Leonid did when I told him, "My life was saved by rock'n'roll"! Eric and I are so enjoying our vicarious vacation with you three!